I thoroughly enjoyed this interview with Marc Aramini and can’t wait to get my hands on a hard copy of his book (and volume 2 for that matter). Whether you’ve read Gene Wolfe or not this interview is certainly worth a few moments of your time. I haven’t read much of Gene Wolfe’s work, even though everybody tells me it’s fantastic. There are 25 novels and almost 10 short story collections, so deciding where one should start feels like a chore in itself (maybe we can christen it as the Moorcock Dilemma). That’s a problem for this year’s Hugo reading, obviously, because one of the candidates in the category of Best Related Work is a book called Between Light and Shadow: An Exploration of the Fiction of Gene Wolfe, 1951 to 1986 by Marc Aramini. It’s a tome that goes through Wolfe’s works one by one, providing analysis, discussion and interpretations — and it’s quite useless for anybody who hasn’t read the original works first. A wonderful interview of Gene Wolfe conducted by Stephen C. Ormsby! Gene appears to mention the title of his next book (the one coming after “The Land Across”), and drops a surprise for you social networking junkies. You should definitely read it. This month’s issue of Locus Magazine is sporting Gene Wolfe on the cover. I haven’t read it yet but his interview is called “Engineering The Future” so my guess is that it’s about science fiction technology becoming reality. A good pal of mine pointed me to a great Gene Wolfe interview done by Josh Wimmer for io9.com. Gene talks about his new book "Home Fires" and the magic behind writing "near future" science fiction stories. I have to say it's one of the best interviews I've seen with Wolfe and really has me excited about reading his new book. 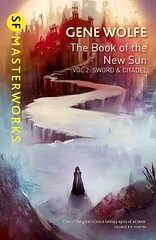 Here is a new interview from December 30th of 2008 with Gene Wolfe by David de Beer on Nebulaawards.com. Good stuff. Great new interview with Wolfe on Sci Fi Wire about “An Evil Guest” and he happens to give away the names of his next two books towards the end. Also, I hear he will be attending the 35th WindyCon on November 14-16th as well. Jeremy L. C. Jones interviews Gene Wolfe on Clarksworld Magazine’s website. He talks a lot about writing. Very good read.